The enterprise landscape has changed dramatically with the influx of millennials — and their preferred devices — into the workforce. As a result, Macs that were once limited to mostly niche usage are now rapidly expanding their enterprise footprint. These devices require the same level of security and oversight that organizations apply to all of their other devices. Otherwise, the risk of leaving Macs either unmanaged or secured by point products creates security gaps that can leave the enterprise open to cyberattacks and compliance violations. 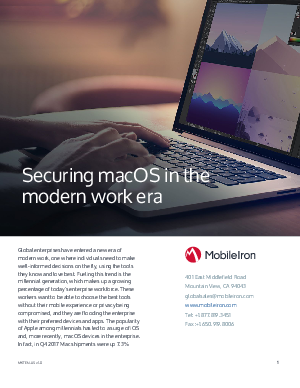 The good news is, MobileIron makes it easy to secure Macs the same way all other devices in the enterprise are managed. No integrations, additional training, or learning curves are involved. The time has come for a modern approach to Mac management that is seamless for end users, improves operational efficiency, and simplifies IT operations across the entire device lifecycle. MobileIron makes it all possible.